Provides all the structural elements of the skin (collagen, elastin, ceramides, hyaluronic acid). 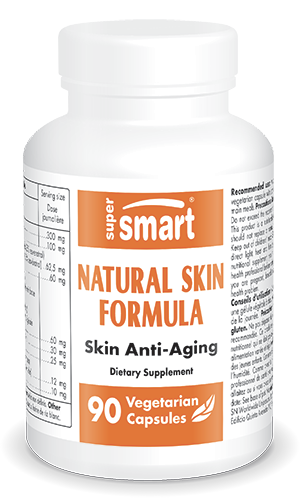 Natural Skin Formula is the only formulation to provide - in one product - all the structural elements necessary (collagen, elastin, ceramides, hyaluronic acid) to rejuvenate the skin, plus ingredients which stimulate their renewal and two antioxidants, resveratrol and SOD-Gliadins, known for their protective properties. accelerates healing of skin wounds. ¤ Collagen and elastin fibres are responsible for the cohesion, strength, elasticity and firmness of skin tissues. As we get older, they diminish; wrinkles appear and the contours of the face start to sag. Supplementing with type II collagen and elastin boosts concentration of these fibres and stimulates their renewal, reducing wrinkles and increasing hydration of the outer layers of the epidermis. ¤ Hydroxyproline is essential for the formation of collagen and elastin. When women with dry skin supplement with hydroxyproline, their facial skin is better hydrated, softer and wrinkles diminish. ¤ Ceramides, rich in glycosphingolipids, account for between 40 and 60 % of the lipid content of the stratum corneum, the outermost layer of the epidermis. As ceramide levels decrease with age, fine lines and wrinkles appear. Supplementation with wheat ceramides improves skin dryness and irritation ; the texture, softness and exfoliation of the skin all improve. ¤ Silicon is vital for optimal production of collagen and elastin. Women with signs of premature skin ageing from sun exposure given silicon supplements benefit from a decrease in wrinkles and an improvement in skin elasticity and roughness. ¤ Biotin, or vitamin B8, is also essential for skin health and, at the dose contained in Natural Skin Formula, has specific structural benefits. scientific research has shown that resveratrol activates the sirtuin (silent information regulator) genes associated with the prevention of ageing. In the skin, the sirtuin genes are found in the keratinocytes and fibroblasts of the dermis and epidermis. In vitro, stimulation of expression of these genes in skin cells led to a slowing down of the ageing process. ¤ SOD-Gliadins complex is a natural superoxide dismutase (SOD) extracted from a variety of melon which is then bound to a wheat protein, gliadin, in order to increase its bioavailability. It boosts the pool of endogenous antioxidant enzymes and protects the skin from oxidative stress-induced skin damage. A number of studies have demonstrated that SOD-Gliadins supplementation delays the appearance, and reduces the intensity, of erythema caused by UV exposure, even in fair-skinned subjects. Take one vegetarian capsule with each of your three main meals.